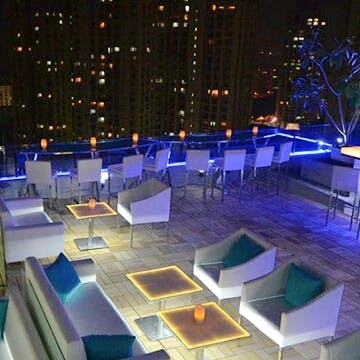 At this place, you can see all of Mumbai and its dazzling lights. I loved the sun-dried tomato pizza. It was really delicious with tomatoes cooked in Italian sauce along with a few spices. The taste was not too hot was just the perfect blend of sauces and spices. The strawberry mojito is magical and delicious. The music played here is a great selection as well, with both recent hits and music from the nineties. This place has only vegetarian food, so perhaps they could include few non-vegetarian dishes too. If you're interested in watching the sunset, go there by 5:30pm. The place opens at noon. The eighth floor has the best views. They serve both Italian and Mediterranean cuisine, and a meal for two would cost INR 2,500. A pint of beer is for INR 300.